A bit over a year ago, as I was sitting in my Institutional Design Studio, I was flipping through my favorite magazine – Metropolis – when I came across a feature story on Georgetown’s Sweetgreen. I was in awe of the historic retrofit, the building used to house the Little Tavern hamburger ‘hut’, in conjunction with its eco-friendly and streamlined interior – I knew that as soon as class was over I would be off towards M Street in order to explore further. Could it be true? Does a piece of design paradise exist with-in a 460-square foot envelope just down the street from me? Fast-forward a year later, to yesterday actually, where my investigation of Sweetgreen continued with Nic Jammet, one of the restaurants three owners (the others are Jonathan Neman and Nathaniel Ru), at their newest location in Logan Circle. Situated on P Street NW, the newest Sweetgreen seems to already be fitting in nicely with the rest of the neighborhood’s eco-conscious surroundings. Although this Sweetgreen location did not have to overcome the same difficulties involving historic preservation, as did its Georgetown counterpart, it is quite obvious that each spot is still designed with its own unique characteristics – making it quite impossible to choose a favorite. To me it seems as though the award-winning, DC-based firm, CORE Architecture + Design can do no wrong when it comes to the design of a Sweetgreen interior. Peter Hapstak III, AIA, IIDA – lead designer on the project and one of the firm’s three principals – brought a young, fresh, and somewhat quirky vibe to the interior of the Logan Circle location. All of the Sweetgreen designs get direct inspiration from the brand’s identity, through color selection and the overall aesthetic appeal. 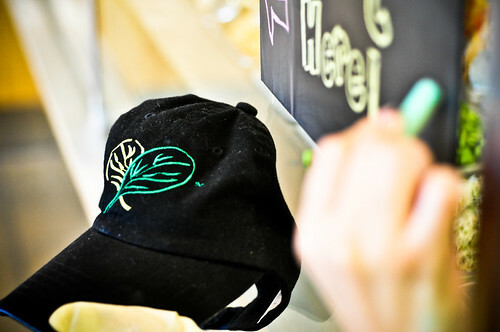 The bright greens of the Sweetgreen logo, designed originally by Olivia Wolf and further enhanced by Unison Design Agency, are clearly translated through the color selection at the Logan Circle location. Furthermore, the lettuce leaf that is also featured in the logo is graphically represented through the oversized wall art decorating the small dining area that seats approximately 20. Both the wall art and the paint selection provide the pop of color that is needed to keep a somewhat neutral scheme vibrant and contemporary. 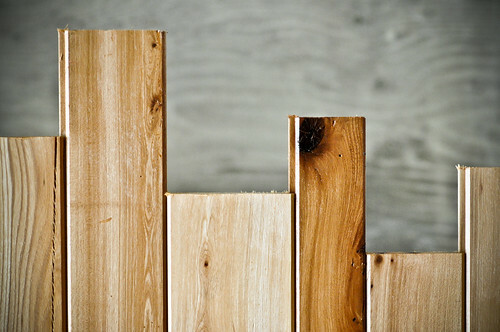 The use of Salvaged Hickory has become a distinctive element within the Sweetgreen design. 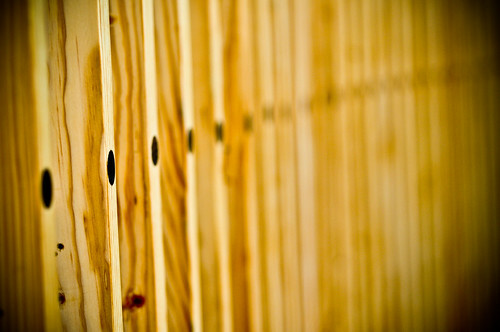 At Logan Circle, the reclaimed wood creates an organizing datum across a portion of the ceiling plane, as it runs horizontally, in a type of erratic, jagged pattern, from the entrance of the restaurant all the way back towards the large menu platform – creating a natural flow for travel and encouraging the eye to focus on the restaurants main attraction, the food. 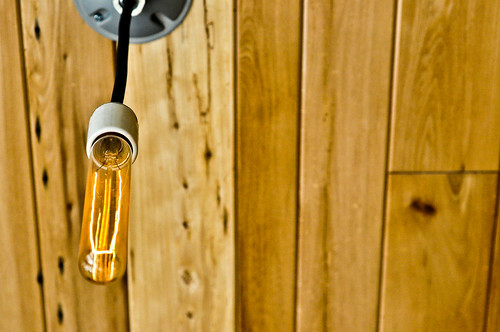 Additionally, the seamless lighting, which is incorporated well into the exposed ceiling, consists of a combination of what seems to be three different luminaire and lamp sources; suspended modular fluorescents, floating decorative halogens, and a few additional adjustable spotters. 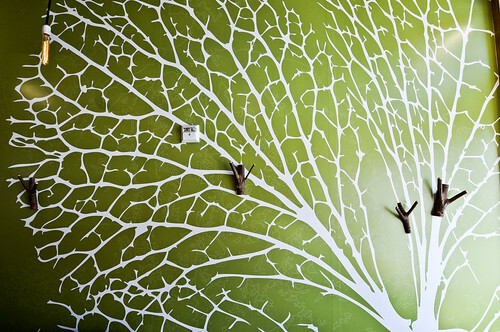 The ceiling is one of those often forgotten elements in design, yet at Sweetgreen, it is undeniably one of the restaurant’s jewels. Although the wood planks on the ceiling run horizontally while looking up, they convert into a more vertical form as they flawlessly converge into the ‘help yourself’ feature located on the left side of the restaurant. The emphasis on the vertical is also highlighted through the deliberate positioning of subway tiles located both behind and below the serving area/bar. Furthermore the cold, retro-tile provides a nice juxtaposition against the rest of the restaurant’s warmer, and more earthy materials – a distinction of contrasting materials that unconsciously makes the food seem as though it is ‘even fresher’ then it already is. 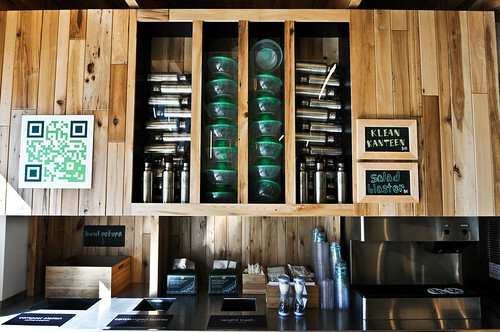 While eating at Sweetgreen it is hard to overlook the incredibly innovative furnishings, which are made entirely of recycled wood from old bowling alleys and are designed by Brooklyn artist Jim Malone. 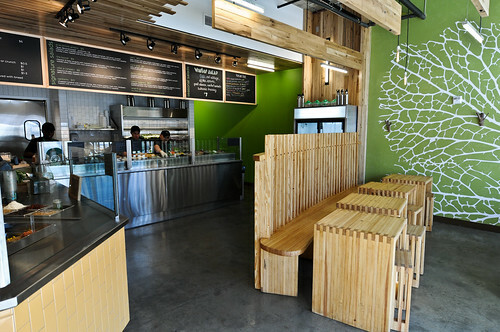 Additionally unique to this Sweetgreen location is the bench/divider that is somewhat reminiscent of a picket fence, the very first of its kind. Adorning each table and the front banquet of windows are planters of live rosemary, having a living element in each location is another part of the Sweetgreen ‘look’, but one that just so happens to also smell heavenly. Although none of the Sweetgreen locations are LEED certified, the sustainable effort of the restaurant’s design is still undeniably refreshing in a world where a nice shiny platinum, gold, or silver building plaque has become all the rage. Moreover Sweetgreen recently added Erin Littlestar, a sustainable food specialist, to their team in order to further strengthen, what was already quite commendable, the restaurants farm-fresh repertoire. One of the neatest attributes at the Logan Circle location is actually visible only to those who venture off to use the restroom. “We build each store differently according to the community vibe and Logan Circle is a really tight community,” said Jammet as he began to walk me towards the back of the house. I was not quite sure what to expect but was pleasantly surprised to find an unpredictable mural covering the walls. Jammet and his partners invited local artist Tang from the Transformer Gallery, located just down the street, to come and create his very own masterpiece as a way to imprint the location with some local flare. 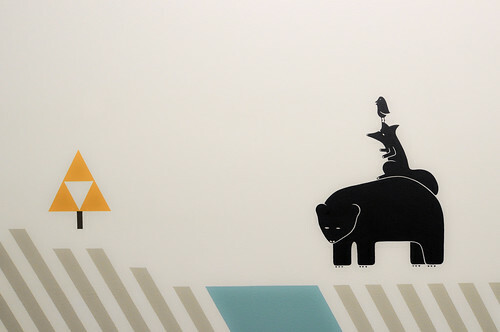 The mural depicts a kingdom of animals, working together, in order to cross over a river – representing what it means to be living within a community. Perhaps what Tang forgot to illustrate in his mural was that the animals were desperately trying to cross the river so that they could get to the Sweetgreen on the other side. In addition to community involvement, Sweetgreen is also all about forward thinking. The technology savvy restaurateurs have recently installed oversized 2D barcodes in all of their locations so that customers can scan the barcode with their phones to receive a very special message that changes each day [author’s note: one must install an app for that]. “One day you may be able to receive a free frozen yogurt and the next day this exact article might be what is featured,” said Jammet. I secretly got kind of giddy about the prospect of that. Sweetgreen is currently located in Georgetown, Dupont Circle, Bethesda, and Logan Circle – and will soon be opening up two more locations in Capitol Hill and Reston, VA. This is such a gorgeous feature! Great job, Sam! I think much love must also be extended to Chris who took the fantastic photographs, my words are only half the story.